Ghost Iron Ore (made into Ghost Iron Bars) is the first tier ore found in Mists of Pandaria. It’s the equivalent of Cobalt Ore from Wrath and Obsidium Ore in Cataclysm. It will be combined in mass by new Blacksmiths into Folded Ghost Iron Ore and prospected by Jewelcrafters into gems. Since Kyparite doesn’t work the same way Elementium did in Catalcysm, Ghost Iron is going to get a lot more attention and this makes it an awesome ore to farm. So, where’s the best place to farm ghost iron? 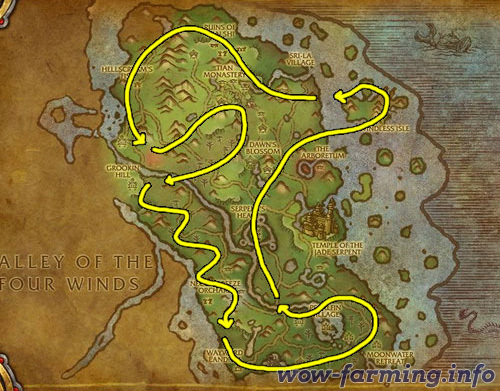 Well, based on the way Blizzard designed Pandarian it’s actually found in all 5 zones. The higher level the zone the more likely you’re going to find Trillium but the lower level the zone the more ore you’re going to find in the same amount of area. 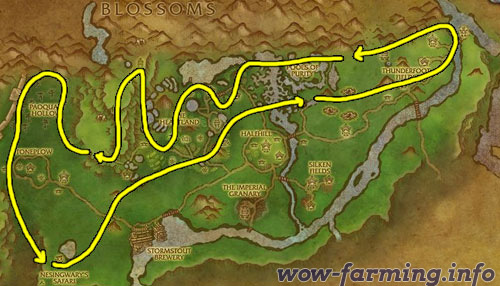 I’ve had great results farming Ghost Iron Ore in Valley of the Four Winds and Jade Forest. Keep in mind you will not have access to flying mounts until they reach level 90. So it’s doubtful you’ll be able to farm Ghost Iron Ore efficiently before you reach level 90. Ghost Iron sells best in Ore and Bar form (not in Folded form) in stacks of 5, 10 and mostly 20. Post it on the auction house at the price you want and wait for it to sell, since prices of high volume items like Ghost Iron tend to fluctuate a lot. Update: You can make a lot of gold with Ghost Iron, but if you want to step it up and make thousands of gold you should read my personal favorite guide. that guide is nice. but not even close to 5000 Gold an hour! Thank you for the information. I would like to add that the money you make will depend on your server’s economy. For those saying it doesn’t yield that much. On my server it goes for about 100g per stack of ghost iron ore. I have seen other servers where it goes for 200-300g a stack and some for 50g a stack so it just varies. On my server it goes for 35g a stack. Fel iron goes for more than ore that’s relevant. Just a thought… but you guys realize that the header “Want to make 5000+ Gold an hour? Read this guide!” isn’t actually a header for this guide but rather an advertisement linking directly to a WoW gold making guide…. right? With the new patch mining skill level is not a problem, so you don’t have to have 500 mining skill. I’m mining out there and I only have 260 or so.